Ok, I admit it. I’m the world’s worst cook. No really… there have been incidents with second degree burns, salty blueberry muffins and exploding pound cakes. This year, I finally decided that since I now have a little family of three to feed, it was time to sharpen my domestic skills and learn how to cook. But – learn how to cook REAL food – food that’s good for my family and nourishes them rather than slows them down. If you followed my amazing blogging spree earlier this year (I was blogging every day for a few weeks – it was a world record for me) you know I tried a lot of new recipes. But it wasn’t until a few weeks ago, when my amazing (and very talented) friends McKay (of Oatmeal Lace) and Amy (of Lily & Bliss) and I made a pact to get real in the kitchen, that I really started being serious about meal planning and cooking good dinners for my family. McKay discovered the TRICK to meal planning and I’m stoked to share it. The three of us have been using it for a few weeks now and it’s AMAZING: PlanToEat.com is an online “Simple Meal Planner & Grocery List Maker.” Sort of like Pinterest, you save a button (I named mine RECIPES) to your browser link list and click it whenever you’re on a cool blog or website that has a recipe you want to try. A little side-window opens, imports the recipe into your Plan To Eat queue or planner and viola! The greatest part…. you then login to Plan To Eat, drag and drop recipes from your queue into your calendar, hit a “grocery list” button and you’re READY! Could it be any easier? 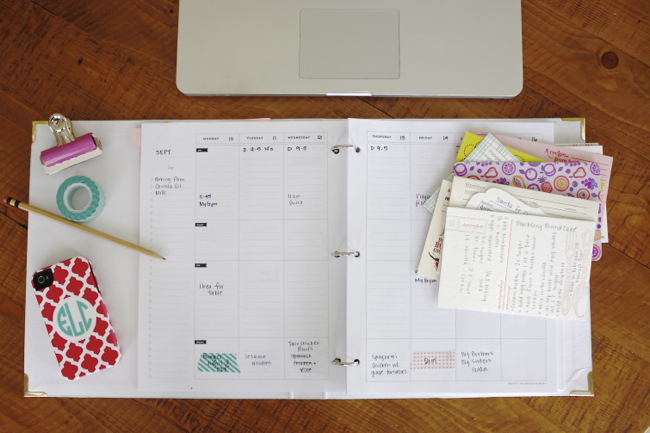 Now what I do (because I like to have things on paper that I can carry around with me) is I copy my meals into my Simplified Planner . I take my list to the store, grab what I need on Sundays and I’m ready to go for the week. Amy and McKay and I are each committed to cleaner eating for our little families of three (they both have precious toddlers too) so we share our “queues” (aka recipe boxes) and borrow each others recipes. I’m working on week three of this process and so far, it’s awesome. Sign up for Plan To Eat here! 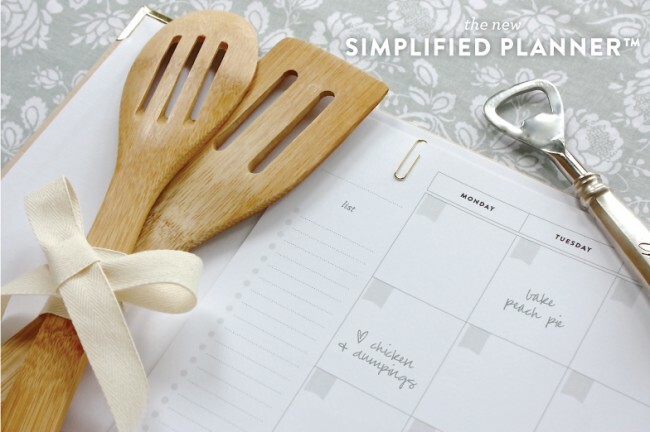 And build your Simplified Planner here before we sell out! We’re down to double digit inventory numbers of the Signature Binder in turquoise – it’s selling FAST! You can purchase the Weekly Calendar pages I mentioned above here as well. 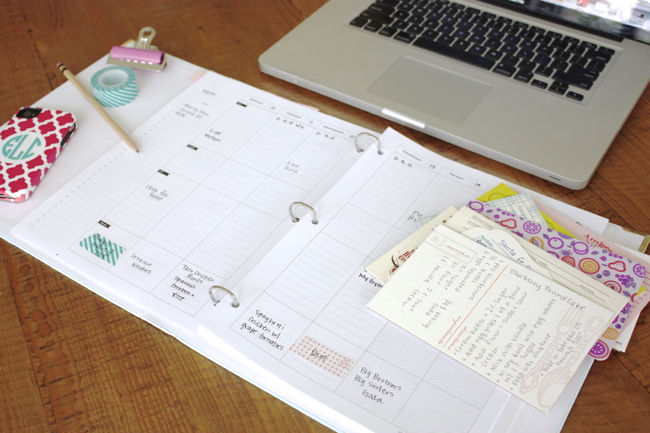 Every week I’ll be posting my adventures in meal planning with my Simplified Planner so stay tuned! Next up, making those Ham and Cheese muffins you see above with Brady! They were delicious! PS: The super cute recipe cards above were from a slew of letterpress exhibitors at the 2011 National Stationery Show.